Flourishing rescues the notion of sustainability from the traps of technological optimism and vapid buzzword. John Ehrenfeld, a leader in industrial ecology, has drawn deeply on philosophy and psychology to make the case that rekindling genuine care for ourselves, other humans, and other life on earth is the key to transitioning our consumerist culture from pervasive unsustainable trends to sustainability. This candid and concise volume iterates between short essays and conversations between Ehrenfeld and his former student, Andrew Hoffman, who directs the Erb Institute for Global Sustainable Enterprise at the University of Michigan. I’ve assigned chapters from Ehrenfeld’s previous book (Sustainability by Design) in my course, “Environment and Society: Toward Sustainability?” and his ideas have resonated with many students. 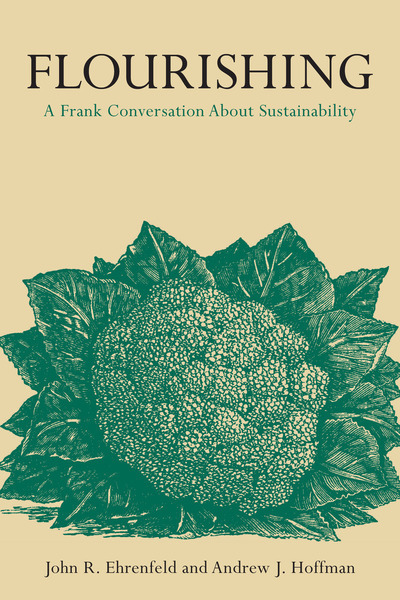 Now we have a book that more fully reveals the force and reasoning behind his liberal arts approach to sustainability.